What’s the first thing you see when you come home from a long day at ___________ (fill in the blank). Does this affect your mood? I wish I could say that the state of my house doesn’t affect my mood but it does. Ok, now that I’ve admitted it, I’ll explain how I plan to change it by creating a Modern Farmhouse ENTRYWAY with thrifted finds. Let’s be honest, I know some of you can relate. Even if my house looks like a bomb went off, (because with two little ones it ALWAYS DOES) I can honestly say I’m a little more content when one area of my house looks decent (yikes, that sounds incredibly shallow, but I’m just being real here). My point to all this is, even if your house isn’t the serene haven you want it to be, you can still create a great Modern Farmhouse entryway with a few thrifted finds. Wouldn’t this make you smile when you walk through the door? This space has a bench, a little greenery and wall decor. Its a small space and It’s simple but it’s elegant and I love it. 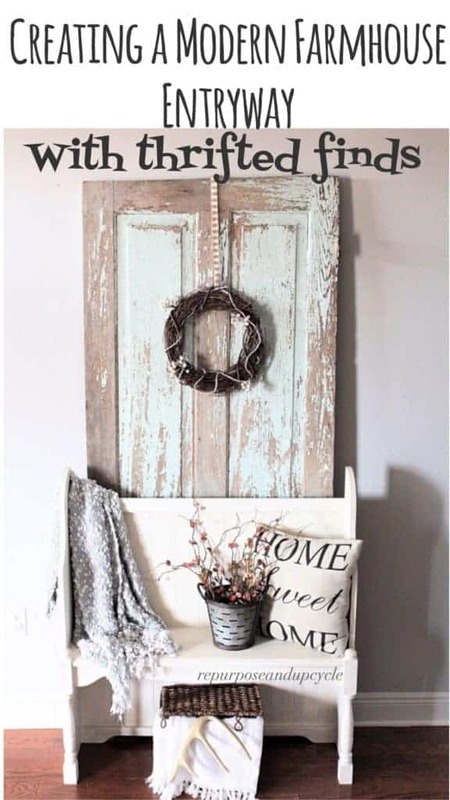 This next photo is my all time favorite entryways on Pinterest and it is from the blog, Bless’er House. I mean who wouldn’t want to see this everyday? a great accent piece for the wall. I couldn’t decide if I wanted a big wreath, picture, or something else. Basically, I wanted a VINTAGE yet MODERN FARMHOUSE ENTRYWAY with industrial touches. My first step in attaining this was finding a great seat. 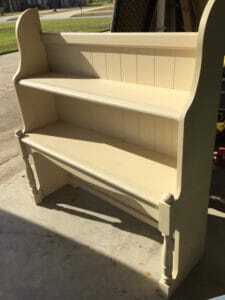 I searched antique malls and thrift stores for pews, and I did find a few, but not for less than $500! Joanna Gaines and her show “Fixer Upper” has surely raised the popularity of anything old and vintage, as well as the price! 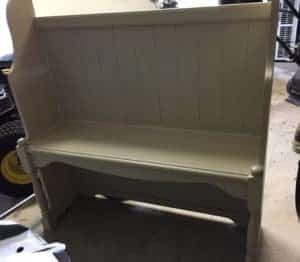 I became a little discouraged in my search for the perfect bench, until I stumbled upon something at a local thrift store I knew I could up cycle. 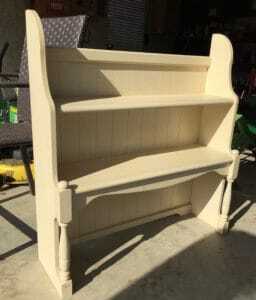 had an “aha” moment when I realized that it wouldn’t take much work to up cycle this from an old computer hutch to a beautiful bench. 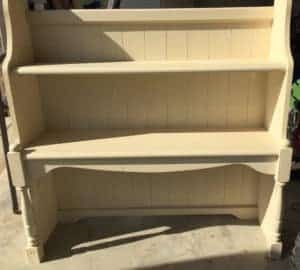 I knew all I had to do was remove the top shelf and suddenly I could repurpose this into a great ENTRYWAY or FOYER BENCH! It was in great condition, very solid, and durable enough for someone to sit on. YAY, it was time for a new project. After removing the top shelf, caulking the seams and spackling the holes. I didn’t like the yellow beige color so I painted it a lighter white. I used a little dark wax to distress it. And then I was done! Now to find the other items I needed for my MODERN FARMHOUSE foyer. I was finally creating my MODERN FARMHOUSE ENTRYWAY with the perfect thrifted find. By the way, don’t throw away any old pillows. I had a tip from a friend on Instagram about ordering cheap pillow covers from Amazon. This “Home Sweet Home” cover was only $3! Seriously, can you believe it! Click on this link for one similar. If you have a ton of dated pillows, head to Amazon and order some new ones. For a few bucks you can transform your entire space! After adding this thrifted chippy door, here is the finished MODERN FARMHOUSE ENTRYWAY! I hope this post has inspired you to create a space that makes you smile when you walk through the door. After all, your home should be a happy place, and a happy attitude is the key to all of it! Want to see more furniture flips? 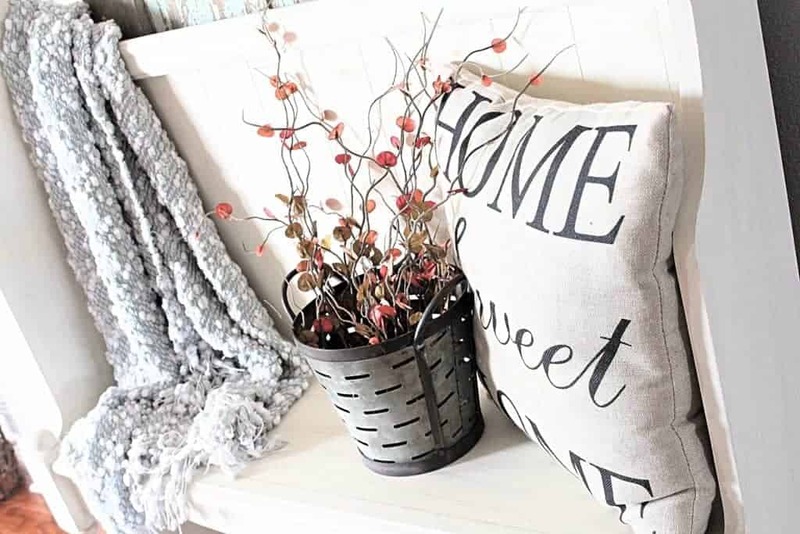 Or how about more modern farmhouse style decor? Thanks for stopping by! Disclosure: this post contains affiliate links. I receive a small commission if you purchase from one of these links but in no way does it affect the price you pay. Your entryway is cuter than cute! We are in the process of building a home and I dream about my entryway often 🙂 Thanks for the inspiration! Thanks so much girl! It takes a little looking to find the right piece for cheap, but so worth it in the end. Thanks Michelle, your kind words mean a lot. Thanks so much! Your kind words mean a lot. Wow you are very creative and talented! Such a beautiful piece! Thanks Lorelai! It’s been a pleasure cohosting. Thanks for the sweet comment too! 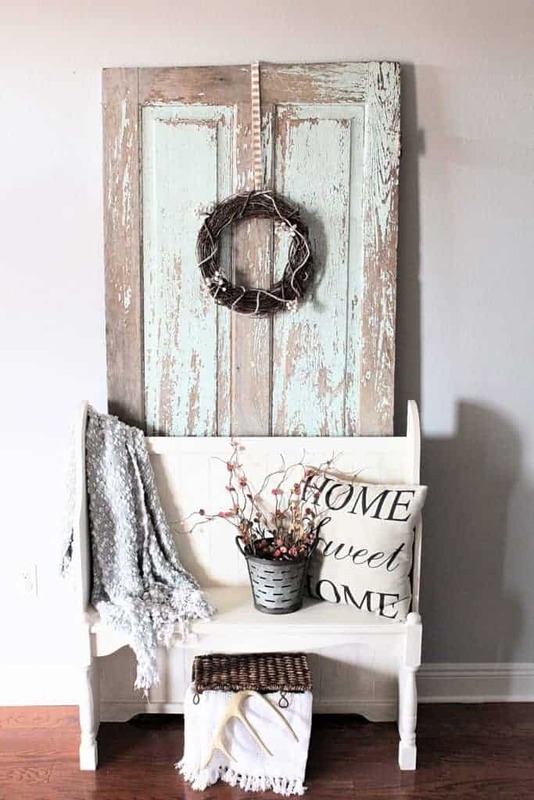 Wonderful repurpose project Lindsey, the bench is adorable and the weathered door just perfects the farmhouse vibe, great staging love it, and thanks for sharing at Friday’s Furniture Fix! I love it! 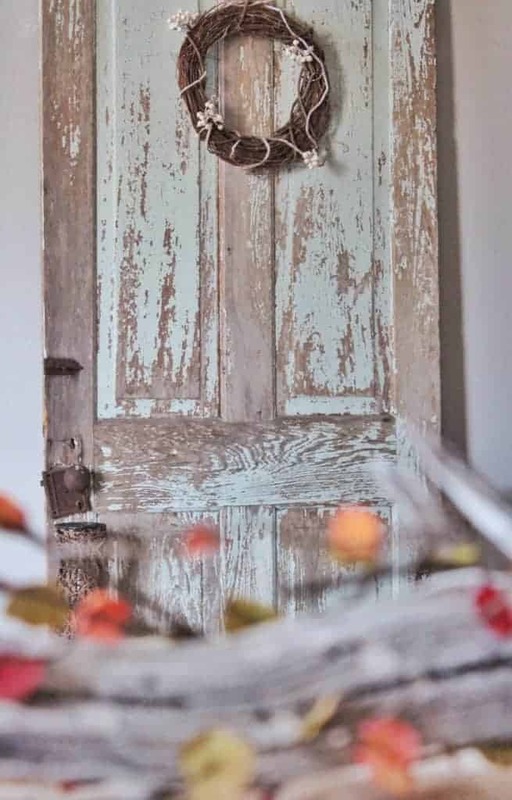 The rustic look of the door is my favorite! 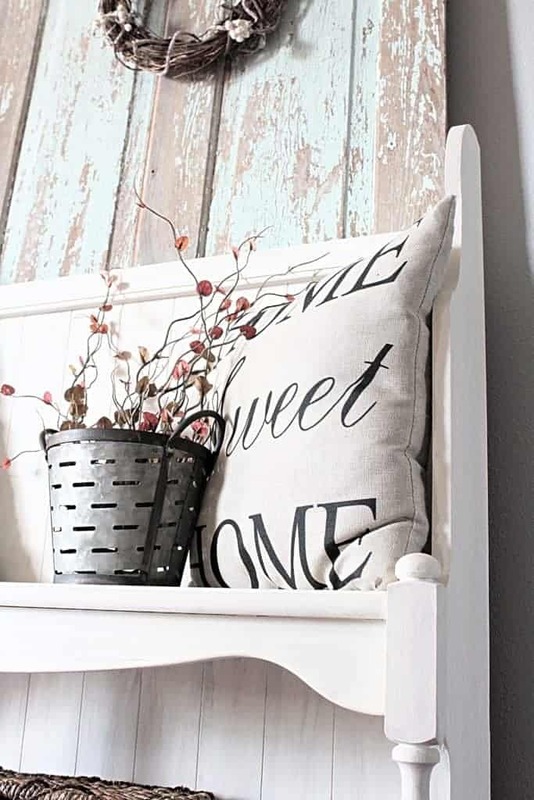 Love your farmhouse entry – the bench is amazing and thanks so much for sharing the tip about the pillow covers. Such a wonderful space to come home to. Thank you Cathy! Have a lovely evening. Very cute! I love old doors! 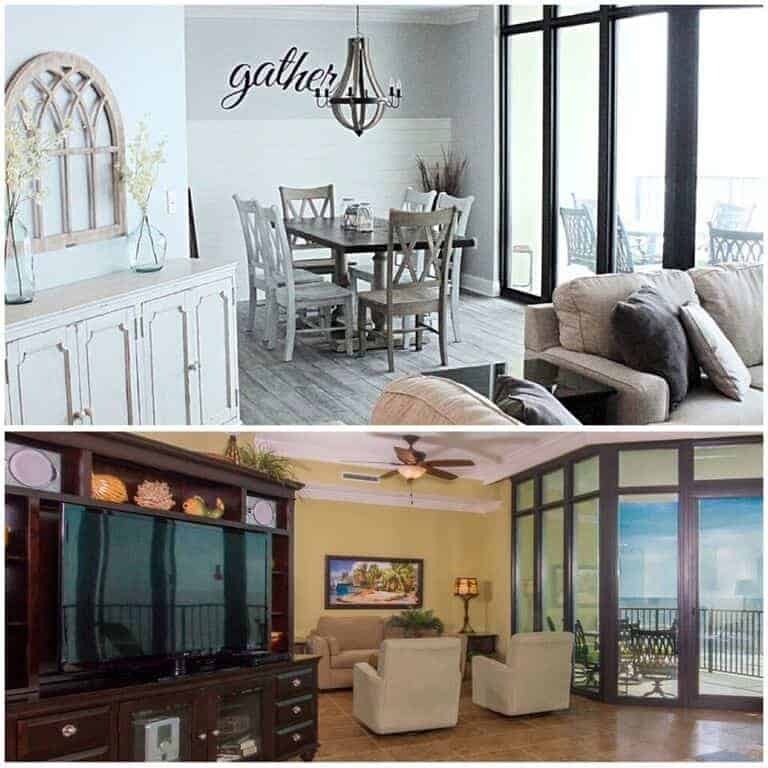 My mother-in-law and I were just talking yesterday about needing our entryways to look nice, even if the rest of the house doesn’t, so it’s funny that you said something similar. I love that this is very doable. I have an old chippy garden bench in my entry with some pillows, and hooks above it for our coats and hats. Isn’t it funny how we need at least one piece of organization in our lives, or I do at least. I hope you have a lovely evening. Oh girl, I’m so glad I found you. Anyone who has the foresight to see a bench in a computer hutch is so worth knowing! You’re going right on my blog list so I don’t miss a post. Awww, thanks that means a lot! Thanks for following my crazy journey! Love yow you re-purposed the desk hutch as a bench. It looks incredible! Thank you Lisa! It was a fun project. Oh your entryway is just beautiful! I love the bench! Thank you for sharing! How creative is that! I would never have thought to use a hutch as a bench. Love how it turned out. Adorable and creative. Wonderful farmhouse look! 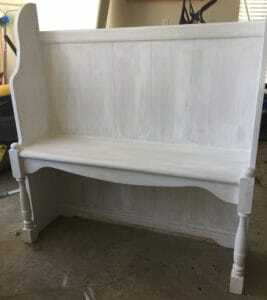 I love the repurposed bench! What a find! I’m so with you. My husband hates that I insist on everything being cleaned up before we go to bed, but it just makes me so anxious to wake up to a messy home! Thanks so much for sharing at the #happynowlinkup! The entryway turned out great. I love the bench. You see the computer hutches all of the time so it is a fantastic repurpose. This looks so welcoming LIndsey and you are so clever to put it all together. Thanks for sharing at #BloggersPitStop this week and have a lovely week. You were so clever to repurpose the shelf unit into a foyer bench. The chippy-paint door with the wreath looks perfect behind the bench. Very attractive! I couldn’t agree more, Lindsey. Love the look you came up with. Your entryway turned out great! by the way, I have the same pillow cover! I have started buying covers instead of pillows because the take up less room. 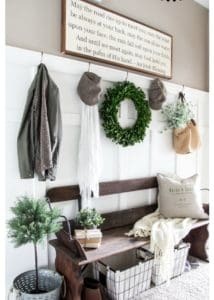 I just hang them up on a clip hanger and they are ready to be used anytime.I love the bench and the door. Perfection! great idea about the pillow covers! THanks for the sweet comments. I love your site and your style too. Maybe one day we can collaborate on something! Have a great day! I wish our entry was big enough for statement pieces. Love your use of color and style. Thanks for sharing at the Inspiration Spotlight Pinned & sharing. OMG! 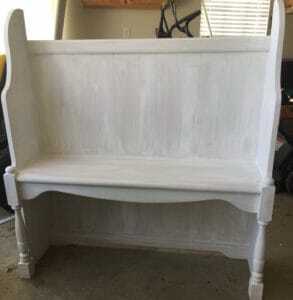 I have searched for a small enough bench to create just this exact style entryway piece. How did I miss seeing what a great idea it would be to use an old hutch? Thank you for such a wonderful idea! so glad this has inspired you! Wow what a transformation! Love the shabby chic look.